Welcome everyone! Good to see you all here! Firstly some news. 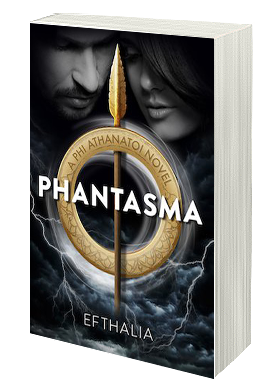 It’s been a long time in the making (since 2011) but I can firmly say that Phantasma – A Phi Athanatoi Novel is just around the corner from publication. It has been held up for some last minute edits that were a necessary evil. Just because we choose to self-publish doesn’t mean we should deter from giving our work the time it needs. I truly hope I have done a good enough job for my first publication. I’ve also decided to do a big market push and that takes time and planning because nobody really knows who I am. To me it was imperative to consider that as a self-published author I need to introduce myself to readers and industry based professionals. In the coming weeks I’ll be sharing a little of my journey with you all(one will be posted right after this post). Yes the preverbal if I knew then what I know now and the common trials and tribulations of the writing process. Warning: Crazy rambling will occur. Now for the fun stuff, I will be running a MAMMOTH GIVEAWAY, which will be open internationally. So look out for it. To finish, I should have some concrete news for you all in the next few weeks, about Phantasma….watch this space.